One hundred and fifty years ago at Promontory Summit, Utah, the final spike was driven, the transcontinental railroad was born, and the nation was forever changed. Immerse yourself in this remar­kable story through historic photographs on view now at the Utah Museum of Fine Arts (UMFA) at the University of Utah. The Race to Promontory: The Transcontinental Railroad and the American West offers an extraordinary account of one of the greatest achievements of the nineteenth century through powerful images that still resonate a century and a half after their making. By connecting the coasts, the transcontinental railroad triggered dramatic economic, technological, and cultural changes, from how fast people could travel across the country to what we eat and how we tell time. 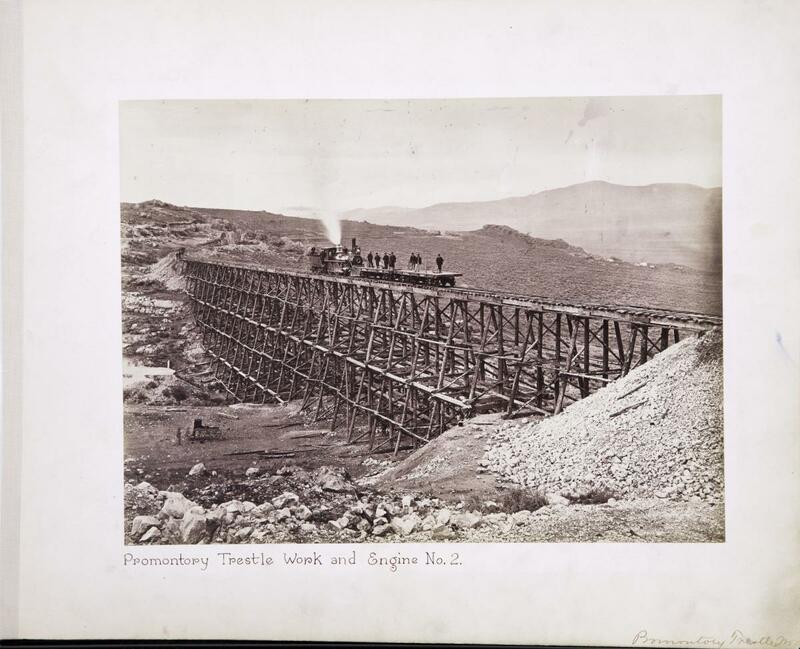 See more than 150 images and historic artifacts from the Union Pacific Railroad Museum and thirty-one photographs by Charles Savage from the University of Utah J. Willard Marriott Library—plus the famous Golden, Nevada, and Arizona Spikes present at the “Meeting of the Rails” at Promontory Summit, Utah, on May 10, 1869. This is the first time the spikes have been reunited in Utah since the historic event occurred. Relive the drama and a West gone by. Which of the nation’s railroad giants would be first to finish? As workers furiously laid track along the Union Pacific line from east to west, photographer Andrew J. Russell photographed construction scenes and surrounding sites. Meanwhile, Alfred A. Hart documented the arduous building of bridges, trestles, and rail cuts from the west across the Sierra Nevada Mountains along the Central Pacific line. Utah photographer Charles R. Savage saw an opportunity and seized it, using his photos to entice tourists and settlers to Salt Lake City, Utah, and the West. Fittingly, this transformative event was captured by the equally groundbreaking medium of photography, which not only documented the work but also captured the moment of the railroad’s completion and distributed it around the world. Enjoy fine examples of early photography and the vintage 3D effect of stereograph cards through specially made viewers that will be available for use in the exhibition. Share your ideas and make your own photographic stories through hands-on activities in the galleries. Hear untold stories from our community. The story of America’s railroad is complicated because it isn’t just one story—it’s many. Join respected historians, educators, artists, and fellow community members for programs that explore the event from a variety of perspectives, including those from Chinese-American railroad workers, members of the Church of Jesus Christ of Latter-day Saints, and Native Americans that haven’t always been reflected in how we talk about this shared history. Get primed for Spike 150 celebrations this year by hopping aboard The Race to Promontory now. No advance tickets are required. Visit umfa.utah.edu/visit for hours and admission. Admission will be free to all on Saturday, February 16, and Wednesday, March 6. On all other first Wednesdays and third Saturdays, exhibition admission will be $5. To see the exhibition for free anytime, click here to become a UMFA member for as little as $49 and enjoy free admission all year! The Race to Promontory: The Transcontinental Railroad and the American West is on view at the UMFA now through May 26. The exhibition is organized by Joslyn Art Museum and Union Pacific Railroad Museum. The Race to Promontory opened at the Joslyn in fall 2018 and travels to the Crocker Art Museum in Sacramento, California, after its UMFA run. Generous support for the exhibition was provided by Presenting Sponsor George S. and Dolores Doré Eccles Foundation, Golden Spike sponsor Zions Bank, Programming and Lecture Sponsor The Hal R. and Naoma J. Tate Foundation, and by Union Pacific, the State of Utah, the Utah Department of Heritage and Arts, and Spike 150.